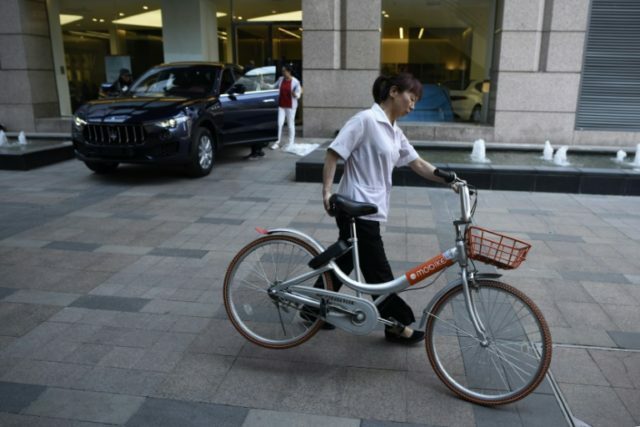 Shanghai (AFP) – Chinese online services giant Meituan Dianping said Wednesday it would acquire bike-sharing start-up Mobike in a deal reportedly worth more than $3 billion, escalating a turf battle between some of the world’s biggest internet companies. The acquisition values Mobike’s equity at about $2.7 billion and Meituan will also assume roughly $700 million in debt, Bloomberg News reported, citing unnamed sources with knowledge of the deal. A joint statement by Meituan and Mobike said the latter would retain its current management and continue to operate as an independent entity. It did not give financial terms or a timetable for completing the deal. The acquisition is the latest salvo in a fight for market share largely pitting e-commerce heavyweight Alibaba against social-media, messaging and mobile game giant Tencent. Alibaba and Tencent — two of the world’s most valuable companies — are jockeying to build competing all-in-one online-services ecosystems that cater to China’s hundreds of millions of digitally-savvy consumers. Meituan’s acquisition of Mobike — both of which are backed by Tencent — comes just two days after Alibaba announced it was acquiring full ownership of Ele.me, China’s leading food delivery firm and Meituan’s main rival. Alibaba said that deal valued Shanghai-based Ele.me at $9.5 billion. The Tencent-Alibaba tussle revolves around their competing online payment platforms, WeChat Pay and Alipay, and the fight to add a suite of online services — from bike rentals to food delivery and e-commerce — that can be paid for via those digital wallets. In shared bikes Alibaba already backs Mobike’s rival, Ofo. Meituan, which began as a group-purchase website offering services similar to Groupon, has expanded to offer a wide range of services, recently adding a ride-hailing app. It is eyeing a possible IPO in Hong Kong, perhaps as early as this year and with a potential valuation of $60 billion, Bloomberg has previously reported. “(The Mobike deal) is quite positive for Meituan as now it fully covers local services of all aspects,” Zhou Xin, president of Beijing-based internet consultancy Jkinvest Bigdata, told Bloomberg. Mobike, Ofo and others have grown rapidly by tapping into the “sharing economy” ethic behind Airbnb and ride-hailing apps such as Uber. Their bikes are unlocked using a smartphone app, cost as little as one yuan (15 cents) an hour in China and can be left anywhere for the next user. Mobike now claims more than 200 million users who take more than 30 million bike trips every day.